1/1/06 | The very first NEUMANN Analog "True Floating Balanced" Summing Amp has come to Life! Already included in our Equipment List! Thanks to the accurate craftsmanship and careful to details design of Michele D`Anca,the new Neumann D`Anca Summing Amp is bound to define a new State of the Art Analog Summing Amp Concept Benchmark! 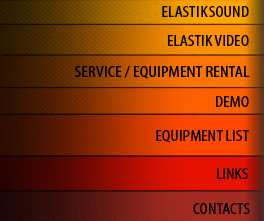 Elastiksound already involved by Michele D`Anca in this purpose helped to push the Sound Quality even further. Thanks to the exhaustive Esoteric and Hi-End Devices listening legacy, ElastikSound helped to improve those important details in order to achieve the Clear, Deep, 3Dimensional, Detailed and Transparent Sound that this Machine reveals! Long and intense listening tests led us repeating exclamations in the Studio as:"... wow...!! !....unbelievable.....and so forth...........!!!" TRANSPARENCY is the final and foremost term good for depicting this wonderful piece of Gear! Max Output Signal: +22 dbm @ 1 KHz 300 Ohm Load.